Democratic Republic of the Congo - The Democratic Republic of the Congo (DRC) is a country central to the work of the Center for International Forestry Research (CIFOR). It hosts over 60 percent of the world’s second largest swathe of tropical forest, the Congo Basin, which is home to endangered gorillas, okapis, chimpanzees, bonobos and forest elephants, as well as thousands of species of birds and trees. It is also home to millions of people, many of whom depend on forests for their livelihood and energy needs. 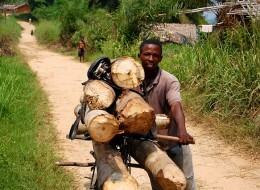 However, prolonged conflict in parts of the country and ongoing unchecked natural resource exploitation leave DRC’s forests at risk. Mining, unsustainable commercial logging, wood fuel harvesting, wildlife trafficking, and hunting have become pressing threats. This is why we must act now to preserve the country’s vast forests. CIFOR’s project FORETS (Formation, Recherche et Environement dans la Tshopo) in northern DRC, is located at the very heart of the Congo Basin where the potential for impact is massive. The project is funded by the European Union and has two main components: First, in partnership with the University of Kisangani (UNIKIS), one of the country’s top higher education institutions, we are training graduate and doctoral degree students in sustainable forest management. Second, we are working with potential investors, private companies, government institutions and development practitioners to kick off evidence-based initiatives to protect the Yangambi Biosphere Reserve and to improve the living conditions of the neighboring communities. The Yangambi Biosphere Reserve is situated in the north of the Democratic Republic of the Congo along the Congo River. FORETS has already supported about 300 postgraduate students, who will become the next generation of Congolese forest experts. From academia, civil society, private sector, or government, they will be leading projects and policies to support the sustainable management of their country’s vast natural resources for the benefit of all Congolese now and for future generations. Furthermore, to ensure that UNIKIS can continue to provide high quality education, CIFOR and partners are building or upgrading some of its infrastructure, including a 2,500-square-meter building on the site of the Faculty of Sciences. The building, which will house auditoriums and classrooms for hundreds of students from across the country, was built following the highest sustainability standards, and is designed to have a low carbon footprint. Over the past 18 months, FORETS has also produced relevant knowledge to fully understand the challenges and opportunities facing Yangambi. The baseline assessments included a wide range of topics such as agroforestry and agriculture, wild meat and nutrition, wood fuel and energy, and logging and livelihoods. Our findings are now guiding the project’s second phase, which will focus on implementing revenue-generating activities and public-private partnerships to translate improved knowledge into action on the ground, to promote a more sustainable management of the forest in and around the reserve. CIFOR’s work is based on a three-pillar approach: rigorous scientific research, capacity development, and targeted outreach and engagement. What is unique about FORETS is that it not only covers these three pillars, but it goes one step further. The project connects science with implementation on the ground, aiming for our research to have a real, tangible impact to the benefit of the Congolese people. How are we planning to do this? First, by working with the private sector, in particular small and medium enterprises (SMEs), to create economic development opportunities around the reserve. Second, by bringing students and scientists to Yangambi to produce applied research that addresses real issues and that can benefit the local communities and support the improved management of the Congo Basin. Third, by creating partnerships with a wide range of actors to create a cross-sectorial long-term vision on how to sustainably manage this landscape. Looking at forests as part of a broader institutional and biological landscape is a top priority for CIFOR. Yangambi’s farms, forests, water bodies, settlements and the reserve itself cannot be seen as isolated elements but are part of the wider landscape in which resource use is integrated. A landscape approach entails understanding and managing multiple objectives of diverse stakeholders, taking into consideration both the natural environment and the human systems that shape and depend on it. We are working to break down the sectoral silos that hamper sustainable development and to bring together the different practitioners, activities, and interests that may positively affect forests if they follow a shared goal. Indeed, FORETS is a perfect example of CIFOR’s landscape approach translated into practice. Such practice in Yangambi means identifying policy options, investment opportunities and research priorities by integrating sectors and scales, negotiating competing interests and demands, recognizing changes in the landscape, and leveraging private and public capital for long-term investments. It is certainly a big challenge, but we expect to address the complexity of the processes affecting the landscape, making sure that we integrate multiple voices and multiple objectives. FORETS will continue its work until 2021 and I will regularly visit partners and project’s activities to witness its impact. Through this unique project we have the opportunity to transform Yangambi’s landscape and create lasting change for the benefit of the environment and of the people. FORETS has an amazing team on the ground, committed to continue building local capacity, conducting top-notch research, influencing decision-making, and making projects succeed. I look forward to seeing the fruits of our work. This research was supported by the European Union.